ORGANISE. Peter Cairns, William Smith and Gerard Duffy with the Riada FC Fives Shield.INBM27-15 131SC. Ballymoney United boss Peter Cairn’s described Saturday’s 3-3 draw with Ardstraw as ‘eventful’. The Showgrounds side found themselves 2-1 down at the break, Ballymoney’s goal coming from Ryan Stewart. However, a frantic end to the tie saw three goals scored in the dying minutes to see the sides sharing the spoils. Steven Lyons equalised for Ballymoney in the 88 minute, before Ardstraw took the lead again. However, straight from the restart, Gerald Gillen equalised to ensure his side claimed a point. “There are no straight forward games in this league, “ said Cairns. 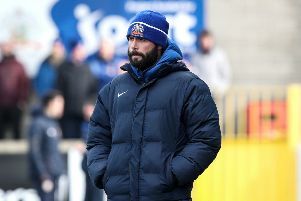 “We still have nine games left, we are sitting second in the league, and I have no doubt that if we keep things going we can be up there challenging,” he told Times Sport. The Ballymoney boss says his aim at the start of the season was to bounce back up again: “The league is wide open. If we are to bounce back then this is the season to do it, before the Championship teams join this league. Next year it will be a very challenging league, and I know that any team that drops down will be pushing, like we are, to get back up again. “We will just take it one game at a time from now until the end of the season, our aim is not to drop any more points like we did on Satruday. We certainly did enough to win the tie. Three of our next four games are at home, we play Dungiven in the Challenge Cup this Saturday (2pm ko).